Before I begin, let me just add this preface in the event that you don't know what the word Auteur means. Auteur- a filmmaker whose personal influence and artistic control over a movie are so great that the filmmaker is regarded as the author of the movie. If you did know what it meant, cool. If you didn't, then it doesn't hurt to learn a new word for your vocabulary. Now on to the review. 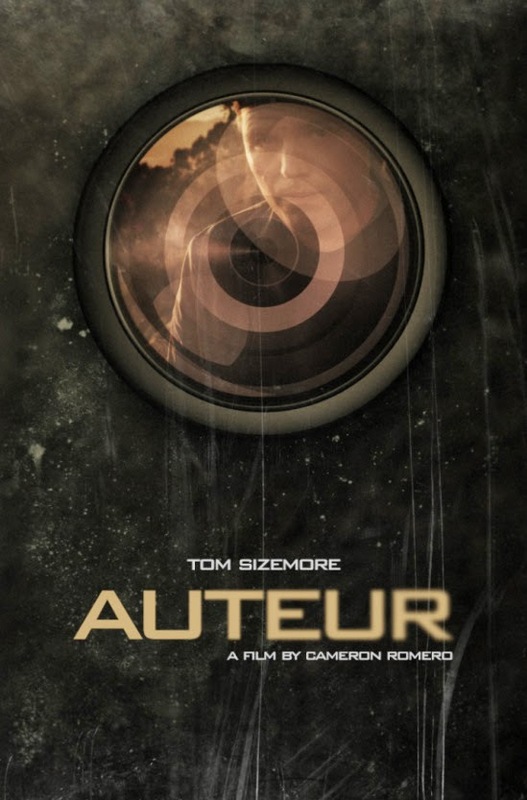 Auteur is a film directed by Cameron Romero, son of the living legend George Romero, and written by James Cullen Bressack, JD Fairman and Michael Sean Gomez. The Story centers on a horror film maker named Charlie Buckwald. Who after a string of hits disappears with his final film, Demonic, refusing to ever release it. After some time passes a super fan named Jack hunts down Charlie for a documentary about the "Auteur" and to find out why he refused to release the last film he ever made. Now I know what you're thinking and you can stop right there. It is nothing like The Hills Run Red. Yes, it sounds like it from the description but the only thing they have in common is the "documentary" feel. There are no masked killers running around here. The execution of the film is surprisingly well done and, for the most part, very original. Whatever short comings the movie has, probably due to budget issues, is made up ten fold by the exceptional cast this movie has. The man who undoubtedly steals every scene he is in, is Tom Sizemore who is playing a version of himself. Tom comes off so naturally and funny that it really sells the documentary angle of the movie. If you where to watch just his parts you would believe that what you were watching was 100% real, and that is just the tip of the iceberg. Jack, played by B.J. Hendricks, takes a few minutes to warm up to, but once you do he totally sells the character of starving film maker trying to make it big with a documentary on his favorite director. The scenes with him and Ian Hutton (Charlie Buckwald a.k.a The Auteur) are really well played and the back-and-forth dialogue comes off very natural. Jack hunts down the AD and crew that worked on Demonic and those scenes might be the best ones or at least tied with Sizemore's. Matt Mercer plays Bruce Chaplain in the film and I'll be damned, but this guy was born to act. Seriously, he delivers a performance of a seasoned vet and owns the role as if he isn't even acting just answering question about a real film that he really worked on. Eli Jane plays the editor Allison Marx of the movie-within-a-movie Demonic and steals all of her scene not just with her beauty, but solid acting ability. Now I know I'm focusing a lot on the acting side of this movie, but that is what really sells this story and makes it worth watching. The film makers new that they had limited resources and did what every film maker should do in that situation, focus on getting talented people to nail their roles.The movie could have been a complete wash had it not had this strong of a cast. The lower end FX and minor plot problems ( I can't say exactly what it is cause that would ruin the movie) are balanced out by the solid performances each actor brings to their character. In an interesting turn Cameron Romero acts as both the director and DP for the movie, which I don't know of anyone off hand who does that or could even pull it off. Yet Cameron captures some great shots throughout the movie and in a funny "meta" way he can be seen in the movie playing Mike the cameraman/DP of the "documentary". The movie does have its weak spots, but they are relatively inconsequential to the overall story. I love huge blood gags and balls out demonic scenes as much as the next guy, but when they aren't conducive to the overall plot I can look past it. So if a bloodfest is what you're looking for then you're not going to dig this. But if you enjoy a solid, character driven horror film that goes down the supernatural path then this is right up your alley and is worth a rental.